Going for a hike? Planned everything, checked your list but got stuck in perhaps the most crucial gear for a trip. Knives! Small but very efficient. I’m not crazy enough to say that there are only a couple of best hiking knives out there because it's a huge industry. There are a wide variety of knives, and each blade has its own purpose. Best for hiking, backpacking or survival, if you’re gonna ask a hundred people you’re going to get hundred different answers. That’s the truth. There is no one knife. People who claim to tell that this “xyz knife” is the best is probably their own personal favorite. But, I run a blog for knives and let me tell you, the answer isn’t that simple. In tough situations, any knife would be handy. But, you are here reading this which means you plan ahead. Kudos to you. I won’t recommend one particular knife, but I will sum up a list of top 10 best knives for hiking & camping just to make things simple. Whether it’s bushcraft, camping, backpacking or hiking, I’ve compiled this list for all possible scenarios. If you are familiar with hiking knives or used them before but looking for a better alternative skip this section and scroll down to the top 10 list. The following part is for those who don’t know what a hiking knife is. So, What is a Hiking Knife? Survival knives are meant for tough work. As the saying goes “there is a well-used knife behind every well-hiked mountain.” I just made that one up actually, but it isn’t far from the truth. Don’t think of it as an accessory instead think of it as a part of the pack. These aren’t anything like your ordinary kitchen knives. Stronger blades, sharper, ergonomic and robust handles and thick looking. Some are foldable; some are fixed. Each with its own purpose. Depends on what chores you will be doing and how you will travel. There are some best backpacking knives out there that are used by marine corps. If you want to know how you’ll be benefited, che​ck out the top 5 uses below. Why You Need Hiking Knife While Travelling? In the wilderness, your knife is a very important tool. Knowing how to use it properly can save your life. You can use your knife to make a fire in the rain, build an emergency shelter, fix broken gear, whittle tools for survival or even protect yourself against wild animals. Depending on their range in size, durability, cost and function and some honest opinions from users, I present you the only hiking knife list you’ll ever need. Preparing Fires If your hiking spot is damp much of the year, you can use your knife to make feather sticks by shaving wood or other tinder to start a fire. Working With Cord For any trip, you need several types of cords like para cord or jute. Occasionally a line will get jammed you need to cut them. Bushcraft It’s the art of creating necessary stuff using whatever you can find in the back country like splitting wood, sharpening, making a campfire, etc. For this, you need a fixed blade. Self Defense Last but not least, self-defense. Small pocket knives won’t do any good though. But a 4-6-inch blade will sure come in handy. Just like any other knife enthusiasts, I know a good knife when I see one.I loved the Ka-Bar Becker BK2 from the first time I saw it. There is a reason why the Ka-Bar Becker BK2 peaked my interest and why I consider it as my top choice for hiking knives. This is American craftsmanship at its finest. The Becker BK2 is a marine corp. knife made for battle. The heavy-duty fixed blade field knife is ideal for camping chores. This is a chunky knife with features of a great cutting tool. It is a tool to carry with you to the outdoors for protection and cutting activities. It is a decent knife for anyone who wants to cut or chop something fast. It is made from some of the best materials and can be used by any outdoor fanatic. This lightweight and durable knife is your perfect companion for skinning game, splitting kindling or even chopping onions. It has just the perfect size and thickness to allow you to cut deeply into things. The drop point blade shape with its versatile 20-degree angle gives you the ultimate cutting experience. Grivory handle with its ergonomic shape provides balanced grip for any outdoor chore. A knife isn’t complete without its sheath. Glass filled nylon sheath keeps your blade safe and sharp. The BK2 is truly one of the greatest survivals knives out there. You can use it to split wood and even prepare a stack for some bonfires. With such amazing strength, it is the perfect knife for tough cutting tasks. It is easy to store safely and to carry around to wherever you want to go with it, thanks to the hard shell black nylon sheath that it comes with. Nothing can come to your way that deserves to be cut that this knife cannot cut. Its cutting edge stays sharp for longer, and that is contributed to by its durability. Ideal blade for performing some light to medium bush-crafting. The BK2 from Ka-Bar feels more solid and reliable than most other within the same price tag. The angle of the blade is useful for the various outdoor task. It takes an experience to realize what could have made the adventure better if it was included. Let's just face it. The Fallkniven A1 Survival Knife is the typical Swedish survival knife designed with various admirable qualities. This is the kind of knife that you can use hard and constantly without losing its strength and quality.It has a simple and charming design that will make you look cooler in the outdoors. People love stylish but highly performing knives because they make you confident in your endeavors. You can carry it with you to a campsite or take it along on hikes or even excursions. It can also stay with you at home for protection and survival in case you need to defend yourself. It has a modified drop point with a generous sweeping belly. The swedge provide improved tip strength and penetrating capability. It amazes me how it can take devastating chunks out of anything that you put it to. It pounds through wood with ease and will stop at nothing. This knife has a design that any knife fanatic will love. It comes with a unique design, and which makes it an excellent cutting tool. It has a beautiful blade that makes it look like a small classy sword. With its waterproof hollow handle, this knife can be used in many places, both in the indoors and the outdoors. I find good for chopping and cutting tough items such as logs. You will be impressed by the quality of the handle too. It stays on your hand steadfastly so that you can cut everything with the required precision. I've used to cut almost anything, including logs, ropes, brunches, and it is a real convenience for people who like to go camping, hiking, or to any other outdoor activities. Even if you were to protect yourself from dangerous animals in the wild where you are camping, this knife will be a great weapon. It can cut a crawling snake into two like a joke. So, when you have this knife, you are safer that when you don't have it. It serves several purposes perfectly. It's like a small samurai sword that is designed with new technology. I know a good knife when I look at it pretty closely. There is every reason to love the ESEE 6P Black Fixed Blade Knife if you know how to tell a good knife. It is innovatively designed to give you more than you can ever imagine in cutting. This knife is strong and elegant so that it makes you proud to carry it around. And let other people see how classy and choosy you are when it comes to hiking gear and protection tools. This knife is made from 1095 steel, which is one of the best materials for making a strong and durable knife. You will have to keep its blade properly lubricated if you want to enjoy its efficiency and dependability. This a true knife for the outdoors, but it is still fit for the indoors. It provides with a sharp, long-lasting edge that will require just a little maintenance to stay sharp and elegant and ready for any serious cutting task. This knife is designed for the outdoors. It is a great tool for different types of outdoor cutting tasks. If you have this in your hiking gear collection, you can be sure that your hiking will be enjoyable and complete. It is made from 3CR13 Stainless steel, which is why the blade is so strong and classy. It cuts difficult items with precision. You can cut glass or rope when you need to. You can use it right out of the box because it comes sharp and ready to cut right from the box. I like how it is has a hollow design on the black G10 handle stone, which is unique. Its high-quality stainless steel blade enables it to resist any hard corrosion. If you want a knife that you can use for outdoor camping and mission trip, disaster preparedness, or self-defense just in case, the CM1013 is the knife you need. It is a spring assisted, an open folding knife that locks securely into place with the use of liner lock. The back of its handle has a stainless steel clip that you can use to attach it to your belt or bag easily. The knife that Bear Grylls himself uses can’t go wrong. However, there is a trick to using this one. If you have seen some of the episodes from "Man vs. Wild", you’ll quickly notice how he uses them. Although you’re getting only ½ of useful cutting length, that half will be more than enough. That’s just how serrated blades are. Spec wise the blade has 4.75-inch drop point shape and crafted using stainless steel. The overall construction is very durable. You can make quick work of paracords and other fibrous material. It also comes with an ergonomic, military-grade nylon sheath, emergency whistle, pommel and fire starter. What more can you ask from a knife? Seems too good to be true right? Spec wise yes but there is a catch. In terms of actual usage and durability, there are better knives out there and costs way more. Did I mention that this one is actually pretty cheap? You get what you pay for. It’s cheap and highly functional. Ideal for normal use. Not for extreme campers, I would say this one will be best suited for average light backpackers. Comparable to cold steel and lesser priced Gerbers. The Gerber LMF II is a specifically designed military grade combat knife. It’s so tough that it can cut the fuselage of an aircraft. Cutting paracords and tent ropes will be like cutting through butter with a hot knife. It has a strong blade with serrated edge. Whether you want to cut firewood or cut through seat belts, the LMF II has you covered. The handle has a different story to tell. The unique, pointer buttcap is made from stainless steel. It’s designed that way to break or pierce glass. You can also use it as a small hammer. The heavy end is separated from the tang that also acts as a shock absorber. I don’t know which one is more useful. The stainless-steel blade or the over molded handle. The Gerber LMF II ensures comfort, safety, and versatility. It’s designed to adapt to any scenario you can throw at it. From the blade to the handle, everything is robust. Being a fixed-blade knife, the LMF II is very strong. You can cut through electric cables without being electrocuted. The best part is you don’t have to break your bank to get your hand on this one. If you are looking for a full-size 7-inch straight edge blade without any other extra functionality, just a pure knife then this is the one. 20-degrees edge angle, 1095 Cro-van steel, 11.875 inches in overall length and a fixed-blade design. Now that’s what I call a perfect combat knife. In fact, it’s the most famous fixed-blade design out there. This one is the result of American craftsmanship at its finest. Except for the leather sheath which is made in Mexico. It’s a presentation grade USMC fighting knife which means you can give it as a gift to your relative in the army. You will also get a protective leather sheath which is rugged, strong and durable. This iconic knife is still used by many campers because of its usefulness. Just holding it you can feel the premium quality. Do keep in mind that this isn’t specifically designed for camping. But, you can still use it though. You just have to be a little creative and have extra space in your gear compartment. The steel used in this knife is 1095 CroVan. Perfect for knife enthusiasts who want to adjust their own angle. You can sharpen it with stone and can still get a decent result. It will rust though, which is easily avoidable if you know how. When I was a kid, I was really into swiss army knives. When I saw this new and improved version of the classic one, I just knew I had to add this one into my list of top 10 best knives for hiking camping. This SwissChamp Pocket Knife here is the big cheese in the world of swiss army knife. There is absolutely nothing that comes close to the sheer diversity and usefulness of this one. For your everyday adventure needs, this one is equipped with 33 functions. I’m pretty sure you won’t even use all of them. It’s nice to have some extras though. The main attraction and the most used function will be the 2.45-inch stainless steel blade. In the knife industry, more movable parts mean less durability. But that’s not the case with this one. I’m not crazy enough to go through all the functions. But for small outdoor chores the SwissChamp can handle them. The blade can be used to peel onions, cut small cords and do what other pocket knives can do. If you are worried about durability, for Pete’s sake, it’s a Victorinox. The only maker of authentic and genuine Swiss Army knives. Need I say more? The number of things you can accomplish with this one is simply mind-boggling. It’s like having a toolbox in your pocket. You never know which one will come in handy. It has just the right amount balance between size and functionality. No compromise in quality and the blade can be re-sharpened to a cutting angle of 30°– 40°. Before you get into the wonderful world of knives, gallivanting in it while trying to find the best hiking knife, there are things you need to keep in mind. While there isn't a single knife that can fit the bill for everyone, there are traits that you should look for in a knife. Light backpackers prefer to use as less gear as possible. Take less do more. That’s the theme here right? If so, go for more functionality. If you want to do more than just cutting and splitting, go for something like the swiss army knife. Again, it all depends on how you want to travel. The best backpacking knife will be the one that meets your needs. You can also opt for the foldable ones as they tend to small and weighs less. I know many of you don’t even care about the handle. It may turn out to be a costly mistake in the long. I can’t stress enough the importance of a handle. How you wield your blade, how it will feel, the grip, etc. are just a few important factors out of many. The handle is half of the whole knife. Its actual importance is also the same as the blade itself. Next time you pick a camping knife, make sure to pay extra attention to the handle. One of the perks of having straight edge blades is that they are great for splitting wood and carvings. It comes in handy when you want to create a bonfire and split wood into pieces that make a good fire. Straight edge is more versatile compared to serrated edge knife. They make better and more precise cuts through materials like metal and rope. Serrated knives have their perks too. But not as much as straight edge ones. For comfort and safety, choosing the proper blade and knife size is important. We all have different hand sizes, and what I feel comfortable with might feel good to someone else. A handle should fit perfectly into your hands for the right leverage. If the blade is excessively big, it becomes difficult to wield it properly. If it is too small, you risk hurting yourself. A good survival knife is about 10 inches when it is in a functioning position. Sharp pointed blade provides the best stabbing potential. It is great for you if you like going on hikes and hunt on a regular basis. Its sharp point makes stabbing quick and easy. If you only use a blade for simple activities, then its point doesn't have to be the sharpest, but you still need to maintain the blade and point, so it becomes sharp when you need it. Stainless steel or carbon blades are the most reliable. Carbon steel is much easier to sharpen and is known to be much stronger than stainless steel. Stainless steel is more rust resistant than anything else, which makes it the perfect choice for using in water or around humid climates. 1. What Is The Best Hiking And Camping Knife For Money? As I have said before, there are a lot of factors for choosing the right knife. It’s like picking a smartphone; you never know which one will suit you until you’ve tried out a bunch of them. From my experience I can tell you this, try picking the one that majority of hiker’s use. You should also consider your budget. Let me summarize my list here to give you a brief idea. Best Value For Money: For those of you looking to get the most value for your buck, The Ka-Bar Becker BK2 Campanion Fixed Blade Knife is the right one for you. Most Versatile: If you want an all in one solution, nothing beats the Victorinox Swiss Army SwissChamp Pocket Knife. It’s everything you want in your knife and more. People’s Choice: If money isn’t an issue, why not go for the most popular of them all. The ESEE 6P Black Fixed Blade Knife is a sturdy, no-nonsense knife. You can’t beat the classic. 2. What Are the Best Knives for Hikers? You should already know the answer by now. If you are still confused, a simple solution is to try getting your hands on one of these knives that I have listed. Rest assured, I have spared no effort compiling this list. If a specific model is not working out for you, try out other alternatives of the same brand. There are others out there. I’m just naming out a few. It’s not possible to mention all of them because it’s a huge industry. 3.What Kind of Knife Do I Need For Hiking? If you are planning for a long hike, my 2 cents would be to take something that has multiple functionalities in it. You know where I’m going with this right? I’m talking about the king of multiple functionalities aka Victorinox Swiss Army Knife. The Swiss Army one is still one of the most popular choices because it’s so versatile. Aside from having two blades, most of them have a screwdriver, cap lifter, can opener, scissors, and a small screwdriver. The standard leather punch as well as other tools all built in. There are also little hooks for lifting stuff off the campfire. Tweezers, toothpick, lanyard you name it. This one is perfect for backpacking and camping, and a must-have piece of equipment for hiking. 4.Where to Keep a Knife While Hiking? Knife safety may seem simple at first, and it often is. But don’t take it lightly. Always keep your blade in your fanny pack. This way you can quickly access your knife. If the blade you are carrying is too big, you should keep them in knife compartment of your backpack. Some lightweight backpacker doesn’t even use backpacks. In this case, a folding knife should do the trick. These are compact and easy to store. If you intend to carry a fixed blade, make sure the sheath is strong and is attachable to a carrying belt. Knife injuries are common while camping or backpacking. Stay safe. Take extra caution while handling a blade. Final Verdict - Wrapping up! With so many of these knives out there, it’s not possible for me to test them all. However, after carefully sorting through some popular choices and actual usage, I was able to select only a few. Again, it’s up to you to decide. Just make sure you’ve researched well enough to make your buying decision. I hope this helps. Make sure to check back for more knife related buying guides. First of all thank you for sharing this article, it was the moment because I had a hike for tomorrow and I really learned a lot, I had no idea that there were such models, personally I will opt for ” Coleman Folding Knife ” because it’s comfortable, Ideal for multitasking, for defense and also it has unique design. I am a big fan of such knives. Thanks for your suggestion I will create a good collection these days though. Having the best hiking knife will give one a great experience of a life time,i think i will rather go for a foldable one which sounds easy to carry about while camping. 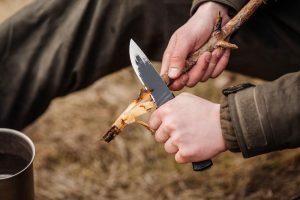 This is a great article, very informative , it has made me become more aware and knowledge about the different types of hiking knives and also about their durability. I will definitely recommend to my friends who lookes to go camping.